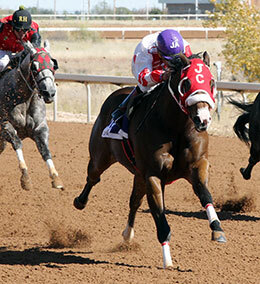 Major Bites, under jockey Jose Alvarez, drives to a 1 ½ length win in the $170,000-Guaranteed Namehimastreaker New Mexico Classic QH Championship(RG1) Sunday at Zia Park. 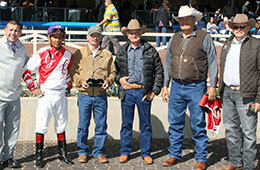 HOBBS, NM—NOVEMBER 4, 2018—For the second consecutive year, Major Bites was victorious in the $170,000 Namehimastreaker New Mexico Classic Quarter Horse Championship, the second stakes race on the Sunday afternoon card at Zia Park. The son of Jesse James Jr is trained by Jesus Carrete for owner Israel Bordier. He was bred in New Mexico by Carlos Paez, out of Dyna Mo Rime, by Major Rime. Major Bites ($4.00) was the morning-line and post-time favorite. In his most recent start, he finished second to champion Jessies First Down in the Downs at Albuquerque Fall Championship Stakes (G1). He had won three consecutive races prior to that loss, the First Moonflash Maturity at Albuquerque and the Mesilla Valley Handicap and Dona Ana County Stakes at Sunland. Major Bites broke from the far outside to defeat Mamacita Cartel by a length and a half. Mamacita Cartel and jockey Edgar Martinez broke midpack, were brushed at the start and made up ground for the second-place finish. The 4-year-old filly is trained by Cynthia Gonzalez and is owned by David Bloomer, who also bred her in New Mexico. She is by Big Daddy Cartel and is out of the Woodbridge mare Posies Woodette. The filly has won five of her 15 lifetime starts, including the $39,000 Jim Drake Stakes at SunRay Park in May, and has career earnings in excess of $160,000. Percyjones and jockey Ricky Ramirez were in second place early until they were passed by Mamacita Cartel to place third by a neck. Percyjones is trained by Blane Wood, owned by Terry and Irene Stennett, and was bred in New Mexico by Benny and Dona Smith. The 4-year-old gelding is also by Jesse James Jr, and is out of the Dean Miracle mare Maggies Miracle Lx. In 14 starts, Percyjones has only finished out of the money in one race. The winner of the 2017 Zia Derby, Percyjones has also hit the board in four other stakes, including a third place finish in the 2016 Texas Classic Futurity (G1). Completing the field were Magnifico Dragon, Play Misty Foreme, A Passion for Flashin, Marcus Medallion, You Can Do it Regard, Cartels Star Daddy and Gon in a Flash. Mr Klee (AE) and Swiss White Wine (AE) were scratched.